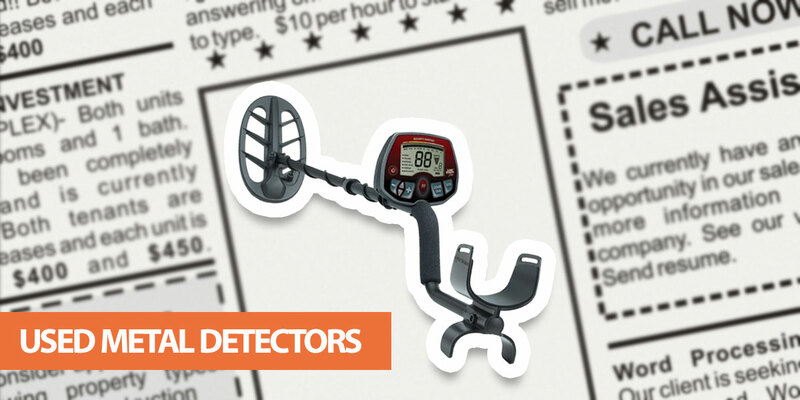 Thinking of buying a used metal detector? To help you get a great deal, I’ve listed some of the best places to find pre-owned models below - along with some vital considerations when buying. Metal detecting is a wonderful hobby - but it can be expensive! While there are some cheap beginner machines available, if you want to save money then a pre-owned detector could be a great option. Serious detectorists upgrade regularly, so there are plenty of excellent second-hand models available in great condition. In this article, I’ve listed some of the best places to search for a used metal detector. I’ve also included some tips on avoiding common scams and pitfalls. eBay - Auction sites are the most obvious place to find a used metal detector. Most models on eBay won’t be pre-owned, but if you're patient there are deals to be found . Amazon - Many people don’t realize Amazon sometimes sells used metal detectors. When you click on a model, look below the price for a link that says “Used & New." Local Newspaper Classifieds - This is a long shot, but it’s possible to find some excellent deals when buying directly from a previous owner. You’ll need to get lucky though - especially if you want a particular brand or model. Craigslist or Facebook Marketplace - Like local newspapers, you can often find a variety of electronics for sale directly from previous owners on Craigslist. Facebook Marketplace is becoming increasingly popular too. Metal Detecting Retailers - Many specialists in metal detecting goods sell second-hand or refurbished models. You’ll pay more when buying a second-hand model this way, but you can contact the company if something goes wrong. Keep in mind that high-quality metal detectors can sell fast - even if they are relatively old. You’ll need to be quick if you want to get a great deal before someone else snaps it up. On the other hand, don’t rush into buying a detector you’re not sure about. Only commit to buying when you’re sure you’ve find the right deal. Note: If you'd like to learn more about where to buy metal detectors - including new models - please click here. The obvious advantage of buying a second-hand detector is the price. With brand new mid-range detectors costing at least $500, buying a used model can allow you to get a machine that would otherwise be outside your budget. Test the Detector Before You Buy - When you go to look at the detector, bring a selection of metals with you. This allows you to test audio and visual signals before you buy. If the detector doesn’t seem to provide accurate tones then avoid it - even if it seems like a good deal. Stay Safe - If you’re buying directly from the previous owner, arrange to meet in a public place. You can still test the detector but without the potential danger of going to the seller’s house. Ask About Previous Usage - Has the detector only been used a few times? Or was it the workhorse of an enthusiastic detectorist? A heavily used model may still be worth buying - many all-terrain detectors are highly durable - but the price should reflect the wear and tear. Look for Boxes - Detectors with boxes retain more of their resale value. Aside from being a more complete package, many manufacturers print serial information on the box. One of the biggest issues when buying a used detector is whether it’s still covered by a warranty. A metal detector is an expensive purchase, so you need to know if your machine is under warranty if something goes wrong. Most manufacturers offer a standard warranty on their detectors. This covers labor and parts should something go wrong with the detector. Please Note: The above information was correct at the time of writing. You should always check current warranty information before you buy a used or new metal detector. It’s important to note that not all detectors are covered by a manufacturer’s standard warranty. For example, the Garrett Sea Hunter has a one-year warranty compared to the company’s standard 2-years. For this reason, make sure you check the warranty of the exact model before buying. It’s important to check whether the warranty was registered by the previous owner within the allowed time (if applicable) and that it is transferrable. You should also ask for the original receipt from the owner. If the warranty is not transferrable, you probably won’t be covered should something go wrong. If you’re not sure about something related to the warranty, you should contact the manufacturer directly. Don’t rely on the person selling the detector to provide warranty information. Buying a used metal detector can be a great way to save money. There are some excellent deals available if you’re patient and willing to wait for the right opportunity. It’s vital to be aware of potential issues when buying a second-hand item though. Make sure you check the warranty information, previous usage and the detector’s response to various types of target. Do you have any questions about buying a used metal detector? Or do you have tips for people buying second-hand models? Let me know in the comments below.